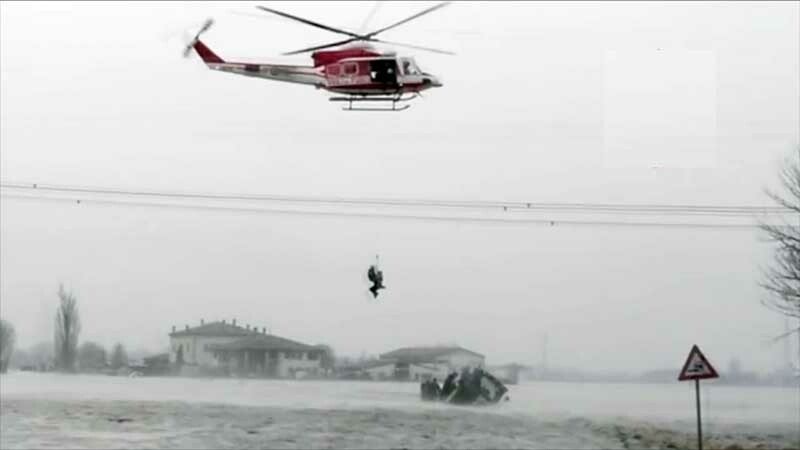 Three people were rescued via helicopter after a river burst its banks near Bologna in northern Italy. Rough cut (no reporter narration). Italy ram hmar lam Bolonia khaw bul lawka awm Rhino lui chu a liam avangin a chhehvela awmte chhanchhuak turin sawrkar chuan mei sipai helicopter hmangin chhanchhuah hna an thawk na sa tih a sawi. A hmuna awm mi 3 leh police 6 te chu helicopterin an chhanchhuak thei a ni. Chung policete chu a tirah a hmuna awmte chhanchhuak tura kal an ni a, chhanchhuah hna an thawh lai mekin lui tui a rawn than thut avangin anmahni zawk pawh chu chhan an ngai ta a ni. Hemi luitui liam hian khaw pahnih a chhim a ni an ti.